Offense sells tickets, but defense wins games. Luckily for the Coupeville High School varsity girls basketball team, it was clicking on both sides of the ball Wednesday night. 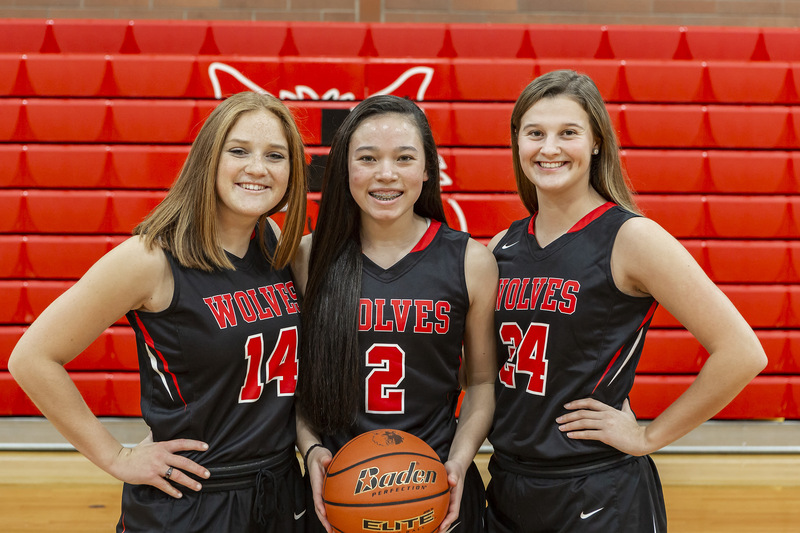 Powered by a season-high 16 points from Lindsey Roberts, the Wolves exploded on visiting Friday Harbor, then turned to a withering defense (and some pressure-packed free throws from Ema Smith) to nail down a 34-32 win. The non-conference victory, which came down to the game’s final play, lifts Coupeville to 1-3 on the season. As exciting as the ending was for the fans, it was heart-stopping for both coaches, as the last 58 seconds were a jumble of nerves, miracle shots, and gut-check plays. Up 32-27 after Roberts slipped a pair of free throws through the net with just a bit over a minute left on the clock, the Wolves looked in control. Then Friday Harbor got dramatic. A pull-up jumper cut the margin to three, before the visitors forced a turnover in the back court on the ensuing in-bounds play. Taking things from bad to worse for Coupeville, Friday Harbor slid a dagger between the rib cages, knocking down a three-ball from the right side that needed a prayer to hit pay dirt, and got that prayer answered. With the game knotted at 32 — the first tie since early in the first quarter — it might have been easy for the Wolves to fold. To put up a good fight, fall just short, and accept a moral victory. Ema Smith, who was born with ice water running through her veins, absorbed a foul with 38.6 seconds to go, calmly loped to the line, stared down each Friday Harbor player one after another, then drilled both free throws. The net barely moved on either shot, the partisan CHS crowd exploded, but Ema Smith didn’t smile. Not yet. Instead, she and her teammates slapped hands, hunkered down and made not one, but three defensive stands, as the clock spun madly towards 0:00 and the score remained locked at 34-32. Roberts yanked down a long rebound on the next shot, only to lose her footing and have the ball skid out of bounds. No problem, as Hannah Davidson, lunging forward/being bulldozed from behind by a Friday Harbor player, pulled in the next rebound. The fact she ended up on the floor after being pasted sent the Wolf junior to the line with 6.9 ticks left, but the rim turned unforgiving, spitting out both of her charity shots. Again, no problem, as Ema Smith tipped the rebound to Roberts and … lost in the moment, the Wolves put up a shot instead of holding on to the ball, letting the clock run and getting fouled. Ball hit rim and kicked way, way out, possibly causing Coupeville coach David King to have an aneurysm as he watched what could have been a game-tying layup at the buzzer by Friday Harbor develop in slow motion. Except, Lindsey Roberts is fast, and by fast, I mean, faster than anyone in a Friday Harbor uniform could ever hope to be in their entire lifetime. Roaring past two rivals in a single bound, she flung out her long arms, fingertips made contact with leather as the buzzer roared, and then she was hugging the basketball to her chest like she had saved a baby from a burning building. Then, and then only, Ema Smith smiled, pummeling her fellow senior captain with glee. As their teammates crowded around, keeping the celebration going, King sank into his chair, let out his breath with a great whoosh, and smiled, too. A game that ended with a defensive stand for the ages began as an offensive slug-fest. Roberts came out firing on all cylinders, dropping eight points in the first quarter. Toss in a bucket from Nicole Laxton, who scooped up a loose ball and nimbly twirled and banked the ball home, and Coupeville had one of its better offensive frames of the season. Only problem is, Friday Harbor had an answer for every bucket, then tossed in two more just because, and led 14-10 at the first break. While the Wolves were trailing, they didn’t look or play as if they were down, though, and promptly took control of the game in the second quarter. Roberts splatted a three-ball from the left side to cut the lead back to one, then after Friday Harbor’s only bucket of the quarter, Coupeville went to work. Scout Smith drained a long jumper off of an offensive rebound, then Avalon Renninger pump-faked her defender into the parking lot, spun past her and sank a gorgeous little runner. That shot proved to be huge, as the Wolves would never trail after Renninger crafted her own personal highlight reel. Three free throws (two from Chelsea Prescott and one from Scout Smith) sent CHS into the locker room up 20-16, then two jumpers from Scout Smith to kick off the third pushed Coupeville’s lead to eight. Friday Harbor refused to break, running off six straight points to pull back within 24-22, before Roberts ended the third with a free throw and then a long, crisp outlet pass that perfectly led Prescott to a breakaway layup. All of which set up the frantic fourth. King praised his team’s effort from top to bottom, while singling out two players for being a catalyst. “This was Scout’s best game on the young season. She took care of the ball and defensively stepped up with guarding their #12 post player,” King said. “She did a great job sticking with her and not letting her get to the spots she wanted in their offense. She also deflected many passes, very disruptive. Roberts filled up the stat sheet, adding nine rebounds, two steals, two assists and three blocks to go with her game-high 16 points. The scoring outburst carries her five slots higher on the all-time CHS girls basketball career scoring chart, from #35 to #30. With 332 points and counting, Roberts passes Mia Littlejohn (317), Marie Grasser (321), Taniel Lamb (330), Misty Sellgren (331) and Amanda Allmer (331). Scout Smith knocked down seven in support of Roberts, while Prescott (4), Renninger (2), Ema Smith (2), Laxton (2) and Davidson (1) also scored. Ema Smith ripped down eight boards, with Scout Smith adding four rebounds and three steals.